Offering you a complete choice of products which include automotive engine valves, three wheeler engine valve and engine valve. We introduce ourselves as a prominent manufacturer, exporter and supplier of an extensive array of Automotive Engine Valves. 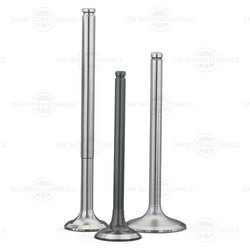 As per the industry laid standards, the provided engine valve is manufactured using finest quality material & modern techniques. Our given engine valve is commonly used for controlling the back flow of liquid and air in diverse engines. Along with that, customers can avail this engine valve at market leading price in a promised time frame. Owing to our rich industry experience, we are offering a wide range of Three Wheeler Engine Valve. This engine valve is known for its excellent performance and its entire processing is based on advanced technology. Our engine valve is well checked on diverse parameters before supplying in the market. We are giving this engine valve on diverse specifications as per the requirements of customers. To meet and serve the demands of our clients, we are engaged in manufacturing, exporting and supplying a qualitative range of Two Wheeler Engine Valve. The provided engine valve is durable and reliable are simple in operations and require less power for operations. Our given engine valve is highly utilized in automobile engines to control fluids and gases. Along with that, customers can avail this engine valve at market leading price in a promised time frame. The outlet valve is additionally heated by the passing hot exhaust gases during outlet clock opening. The valves are cooled down mainly by conducting heat via the valve seat insert to the cylinder head. The Engine Valves are made up of heat resistant alloy. Various processes like Chrome flash on Stem Satellite on seat and tip area, Nitriding / Tuft riding are offered. The machining of outer diameter and radius of engine valves are processed on CNC Machine.